Overall Impression: Spacious accommodations with larger than normal rooms in a nondescript concrete building that has been added on to over the years. 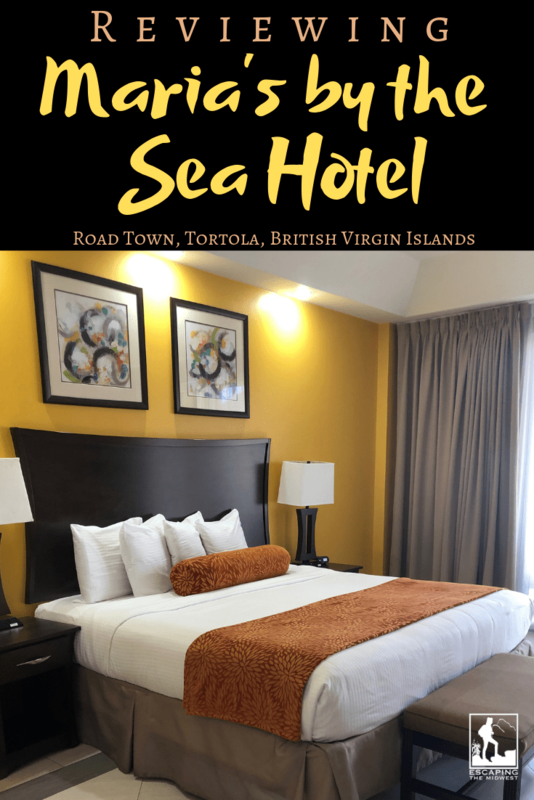 Maria’s by the Sea Hotel is only one of a handful of hotels in the Road Town area of Tortola. Like most tourists in the area, I was part of a group chartering a sailboat for a week and needed a one night stay here prior to departing. Maria’s by the Sea Hotel is located in the busy downtown area of Road Town, the capital of the British Virgin Islands. It is steps away from “Craft’s Alive,” which is a small local marketplace where you can buy handmade items and traditional souvenirs. (Sellers here do tend to be quite pushy and invite you into their stores, while convincing you to buy something.) 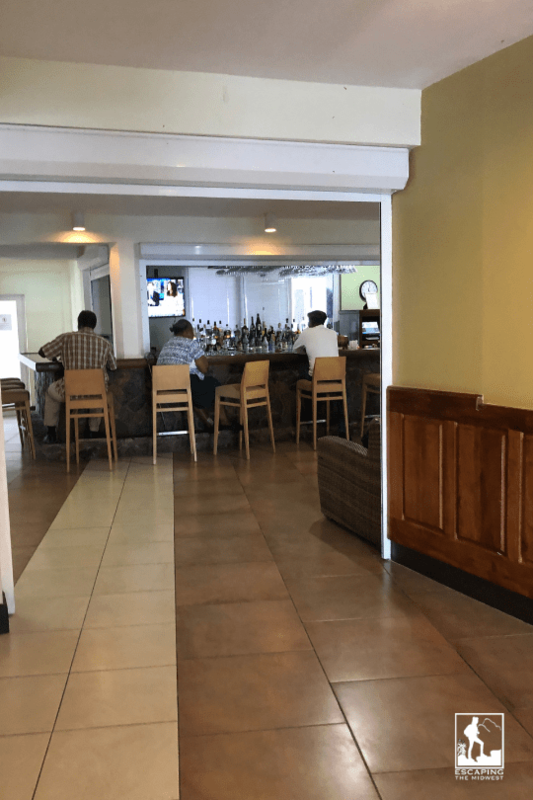 It’s also located close to Pusser’s Pub and Restaurant, the BVI government building, the banking district, the Road Town Ferry Terminal (a HUGE plus for us, heading back to St. Thomas via ferry), and the cruise ship pier. The back of the hotel even faces the ocean, with an albeit drab slab of concrete that sits in front of the water. While in the taxi on the way to the hotel, we didn’t know we were pulling into Maria’s by the Sea Hotel because there was no road sign or large sign on the building, advertising the name. Only a small sign remains visible on the edifice. There were multiple doorways to get into the hotel, as it is connected to a few rental car companies (Alamo, Enterprise, and National). 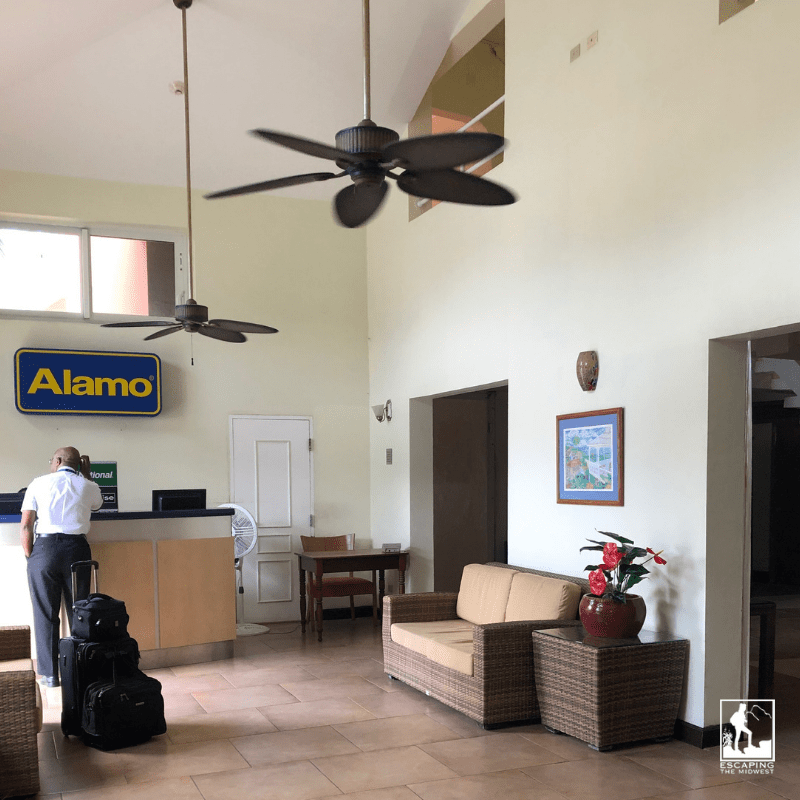 Within the breezy lobby of Maria’s by the Sea Hotel was a small seating area, vending machines, the car rental desk, and hotel check-in. While checking into our room, we found the employee behind the desk to be completely unfriendly. She checked us in and gave us key cards, but didn’t go out of her way to make us feel welcome or even smile. The hotel seemed to have only one elevator for four floors of rooms, but fortunately the hotel wasn’t busy during my one night stay. To get to our room, we had to zig zag a bit through buildings because of the hotel’s additions. The concrete building and its open hallways did seem uninviting and a bit cold, but I understood that building the hotel with concrete was probably done to withstand tropical storms and hurricanes. We booked a Premium City Room and all of the ‘premium,’ upgraded rooms are in the new wing. Once inside our room, I was pleasantly surprised. The furniture and fixtures were new, modern, and pleasantly clean! The Premium City rooms were definitely spacious, but almost too spacious! I was surprised at how big the rooms were, when simply equipped with the standard hotel furniture: bed, night stands, chair, dresser, and desk. The floors were tiled throughout the room (a rug would have warmed up the room a bit), the bed and linens were nice, and there was air conditioning (similar to rooms in Europe where you have to put your key card (or other plastic card) in the slot to keep the a/c running). 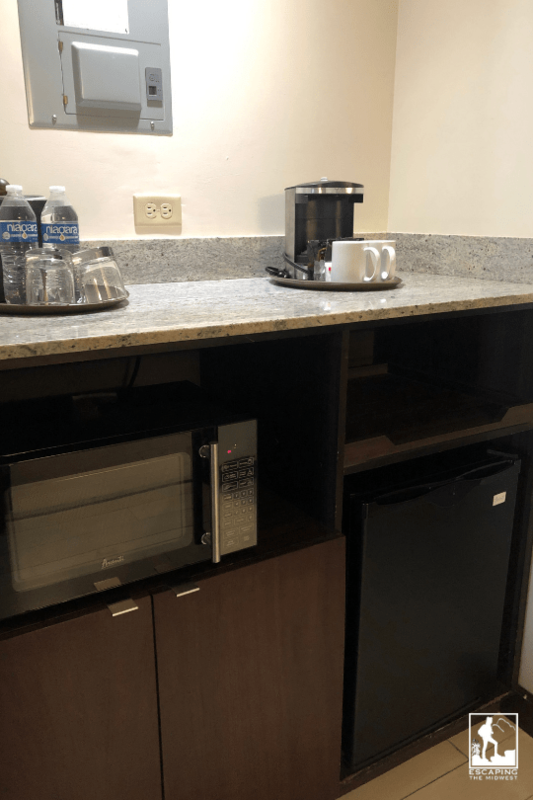 There was a marble counter just past the doorway, that contained a coffeemaker, bottled water, cups/glasses, a small microwave and mini-fridge. Wifi was also included and all rooms have outdoor balconies. In the closet behind the entry door, guests can find hangers, an iron and ironing board, a luggage rack, and a safe. Counter with beverages, microwave, and refrigerator underneath. There are other guest rooms to choose from, other than the Premium City room (which faces downtown Road Town). At Maria’s by the Sea Hotel, you can choose from the Premium Ocean room, the Premium City room, suites, as well as three other tiers of older rooms within the original building. The view from our Premium City room. Just like the room, the bathroom was spacious as well. However, more shelving, hooks, or organizational cubes could have been utilized in the empty space. It was unfortunate the walls were concrete, as only one towel shelf (that held all of the towels) was installed. No towel hooks or holders were near the sink; only one on the back of the door. Toiletries were provided for guests, as were ample towels, toilet paper, and a blowdryer. The shower in our Premium City room was a tub/shower combination, but it would have benefited from having some shower shelving for razors, toiletries, etc. Overall, I found the bathroom to be modern, clean, and sufficient for a one night stay. The pool is open from 7 am – 10 pm daily; pool towels are available at the front desk. 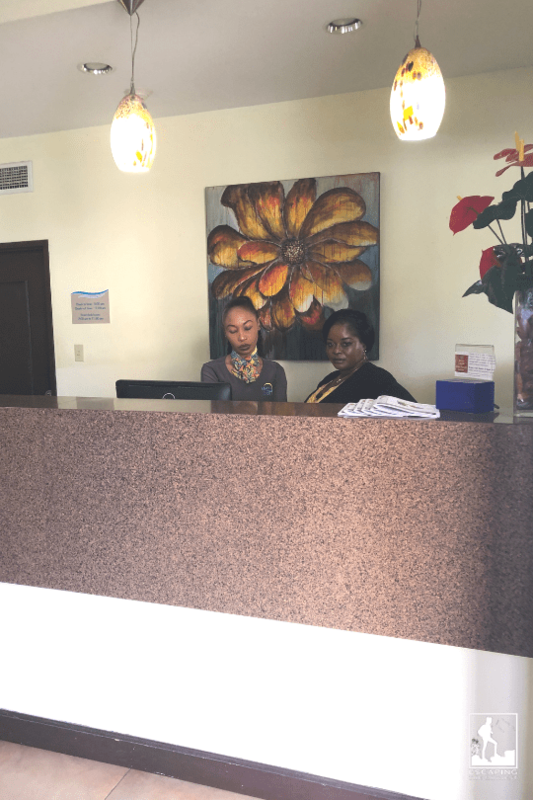 The business center at Maria’s by the Sea Hotel is located in the lobby hallway. Here, guests have access to computers, internet, photo copying, and scanning. Ice can be found either at the bar by the lobby or at the ice machine on the east wing of the second floor. Laundry service is available Monday through Sunday. The bar, located off the lobby and next to the dining room area. It seemed to both my husband and myself that the quality in craftsmanship at this hotel was lacking. There were many things we saw that were obviously unfinished, poorly constructed, or not cared for. (We don’t nitpick construction but these blemishes were very obvious). A walkway in the back of the hotel was unfinished, exposing people to unsafe terrain; tiles in the floor didn’t line up quite right; the pool was half covered (a safety hazard, which could lead to someone being trapped underneath); and some gaps in the concrete walls didn’t have covers on them. To be fair, I do not know how much this hotel suffered from the hurricanes of 2017, and perhaps these are details that they plan on finishing in the future. The staff at Maria’s by the Sea Hotel could use a refresher course on courtesy. I understand that dealing with tourists from other countries can sometimes be draining, but if you work in the tourism industry, you should be expected to put on a friendly face. There is 10% government tax and a $25 hotel fee that is added to your final bill. You can cancel up to 48 hours before your arrival. A credit card or a one night cash deposit is required to secure your reservation. Check-in is at 3 pm and check-out is at 11 am. Tortola does not observe Daylight Savings Time and they follow Atlantic Standard Time (AST) year round. Yes, all US citizens need a passport to travel to the British Virgin Islands. Driving is done on the LEFT on BOTH the US and British Virgin Islands. Roads are steep and narrow; drive with caution or get a taxi! 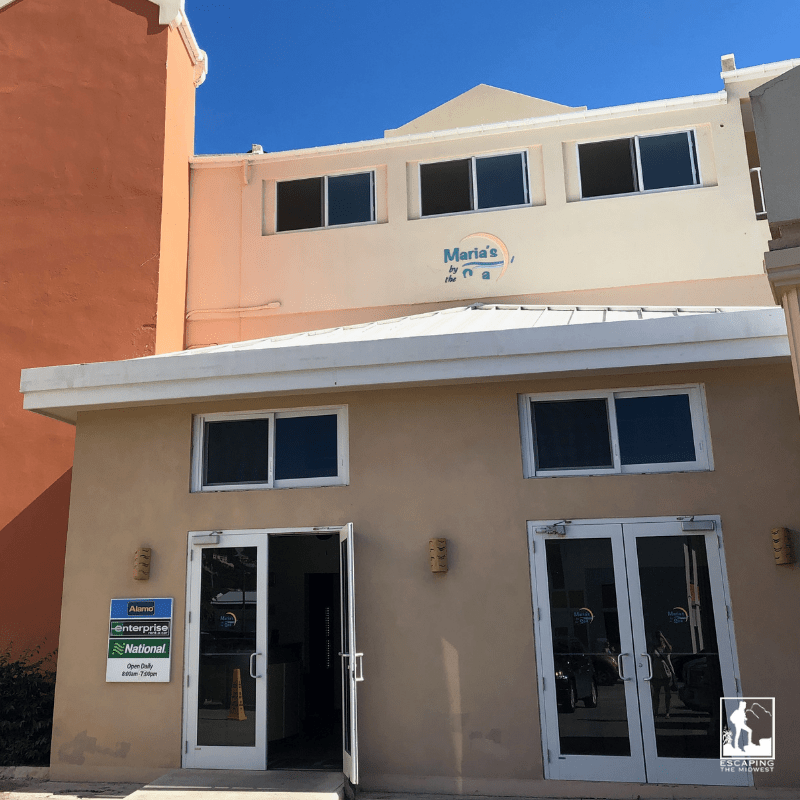 Maria’s By the Sea is a nice hotel to spend a couple of nights in as the accommodations are great (for the Premium City Room) and there are dining options on property. However, it’s not a resort nor a place to keep a family entertained for multiple days. By the way, this unbiased review is being posted after staying at the hotel as a regular guest. I’ve received zero compensation or endorsement of the hotel as a result of this review. Have you been to Road Town? Ever stay at Maria’s by the Sea Hotel? Let me know in the comments. I’d love to hear from you!